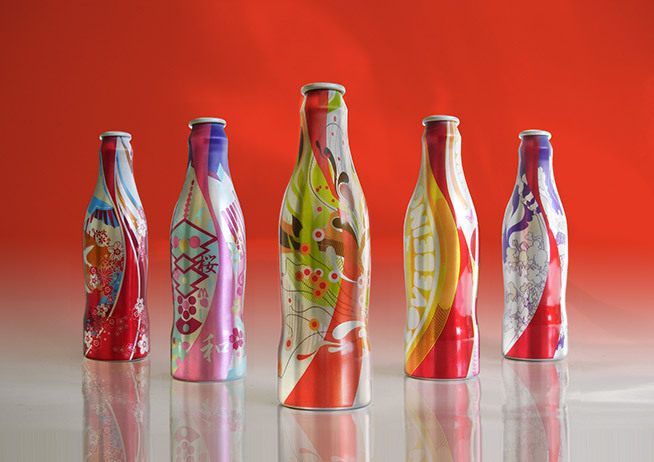 When a collection of artists, from every continent, were asked by Coca-Cola to develop the concept of ‘better world optimism’ and turn it into something wonderful – without restrictions or prerequisites – it was not difficult to predict that the result was going o be something special. Various artists were commissioned to imagine and visualise a better world, knowing that if they were successful, it would fuel individual imagination and empower other people to make a change in the world around them – micro – or macrocosmically. How did your collaboration on this design come about? The collaboration has its roots in the friendships that were forged when we started studying together at the University of Pretoria in 1995 and we decided to come together for the purpose of M5 to create an emotional blend of luminous imagery and motion artistry to visualise Fischerspooner’s “All We Are”. Coca-Cola is an icon of global culture and you’re at the forefront of this groundbreaking innovation. How do you feel? Coca- Cola is possibly the biggest and maybe the best brand in the world. Its core consumer group is the youth of today and more importantly the next generation, who simply don’t share the same emotional bond with the brand as the ‘baby-boomers’ did. With the M5 ‘Better World’ project Coca-Cola wants to re-inspire individual belief that we all want our world to be a better place and make meaningful in- roads into youth culture in ways Coca-Cola has never done before. How did you identify with the theme ‘Optimism and the creation of a better world’? Africa represents the unknown. It includes hundreds of cultures that are thousands of years old. We drew inspiration from the myths, legends, fables, songs and proverbs that define this birthplace of mankind and found that it has striking similarities with so many other cultures that have developed in opposite corners of the world. Revisiting these roots and re-connecting with all the wonderful things this continent and its people has to offer, presented us with an awakening. Can you elaborate on your design for the bottle? Today a universal consciousness is growing which sees the embrace of the things that make us different, whilst understanding that fundamentally we are all one. Understanding of our ‘oneness’ provides a foundation for the building of a better world. The search for a collective origin has taken many researchers to Africa – which is widely acknowledged as the cradle of mankind. Our product was always destined to speak a universal language and find just the right resonance with the youth. Representing Africa as part of M5, we hope to draw on our distinct frame of reference, as Africans, to bring our story to the world. We chose to team up with Fischerspooner to provide the soundtrack for their video. In their interpretation, of Fischerspooner’s ‘All we are’ a magical Midas-effect is illustrated quite literally – as the world is transformed into something more imaginative, most beautiful & therefore genuinely better. The video features ‘Malaika’, a mythical figure from East Africa, who was created from The Light, and is entirely transparent (literally and figuratively speaking). Malaika loves people and transcends, from heaven, every 400 years to serve people in distress. Its heavenly glory is so dazzling that it defeats any evil that comes into contact with its mystical display. This context made the task obvious to the artists to transform the world into something magical. And so a memorable and concentrated six-week process began. The motivation comes from the inherent yearning which all humans share and the inspiration is complete – it is there for everyone to experience; and the effect is the birth of a virtuous circle through which a better world is created. This is a big step for you – where to from here? Briefs like this are hard to find. When you are commissioned, as an artist, to interpret a theme as positive as ‘better world’ for the biggest brand in this world – carte blanche – the motivation finds you! Through our involvement in M5, we hope to see the project boom as it launches internationally over the next year. If, through our involvement, M5 can deliver the same kind of success to Coca-Cola, it would serve as a case study to other leading brands on how to invest in creativity and make it work. Needless to say this would further our cause in a big way. We are a young company and exposure at this level is something that we thrive on.